This is not the first HD radio I have owned, the Jeep Cherokee had one that I install myself. This is the first time it came with the car and I didn’t even mention it to the sales guy. Many stations’ HD1 channels don’t sound very good, they are either shrill and tinny, or not synced with their analog counterpart. There still aren’t very many station transmitting HD Radio; FM stations are either NPR affiliates or belong to a few larger corporate owners. The AM stations are few and far between. 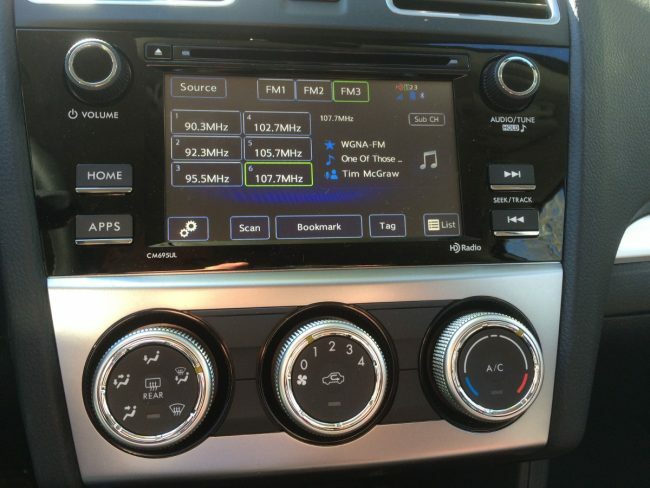 AM HD Radio still has numerous problems in the mobile listening environment. Many of the HD 2/3 don’t sound very good; low audio levels, muffled modulation, low bit rate audio, etc. The only exception that I have found so far is Vermont Public Radio’s classical format, transmitted on the HD2 of WVPS, Burlington. As far as the new ownership by DTS goes; I will reserve judgement until they do something with it.